A while back my portable external hard drive decided to die on me, costing me a wealth of photographs and files that I specifically backed up on said hard drive. Then, a short while after that, my desktop PC contracted a virus (possibly due to some download I may have had going) and it too gave up on life and now cannot be rebooted. As annoying as this may be to anyone, for me it was especially annoying as I’d saved several of the raw files from the promotional work we did for ‘Cop on the Edge’ onto the two devices. I suspected, with a degree of certainty, that these files were lost forever. However, a recent attempt to clear up (albeit a half assed attempt in truth) turned up some recordable CDs containing data files that I’d made some time in the last millennium. Could these files contain the documents and files that I wanted? Would these CDs actually have the layered PSDs of the original artwork we’d used for leaflets and posters to promote the film around Newport and Cardiff? Why yes, they certainly did. On the CDs were the original VCD and VHS covers (this was before DVD) and the files for the posters, leaflets and flyers we’d created. 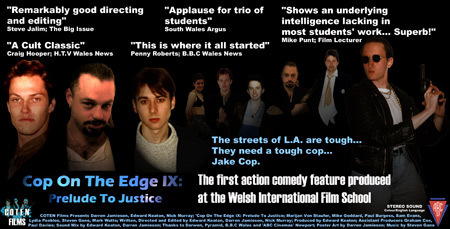 Upon seeing the leaflet once again I remembered how I’d been almost arrested by the police for ‘fly posting’ in Newport as I’d plastered leaflets for the film around the town using a readymade wallpaper paste. Did you know that posting leaflets on walls was illegal? Well, it was for a film about a cop so I guess I scored points for irony. I’ll have to remember that for next time; while leaflet printing can be done cheaply, actually posting the leaflets around a town requires permission… dang. Previous PostSubway’s sandwiches don’t match its food photographyNext PostIs this the worst SEO email? You’ve gone down in my estimation!!! When you back something up somewhere, you need to keep the original as well. Alternatively you need to back up the backup, because drives can always fail.